Chinese artist and activist Ai Weiwei takes us around the world to explore the global scale of the refugee crisis. Having been a child refugee himself in China in the 1950s, artist and activist Ai Weiwei experienced firsthand the hardship of living in a camp and being left feeling stripped of his humanity. The engaged filmmaker recently wrote an opinion piece in The Guardian explaining that as the son of an intellectual sent to labour camps for “re-education,” he deeply identifies with all the “unfortunate people who are pushed into extreme conditions by outside forces they are powerless to resist”. Far from being powerless himself, Ai Weiwei decided to embark on a two-year journey around the globe traveling to 23 countries and 40 refugee camps to document the life of some of the 22.5 million refugees recorded worldwide. Human Flow, the documentary resulting from this two-year project, is a powerful reminder of the global scale of the refugee crisis. From increasingly dangerous boat odysseys to endless dirt tracks, we are compelled to follow various refugees around the globe fighting for their lives every single day, rain or shine. With some European countries closing their borders, many families face dramatic living conditions desperately waiting to get a way in. Staying under pouring rain, those human beings are left to survive on little food and fighting off diseases that are spreading like wild fire, among others. Showing us fragments of the lives of displaced populations from across the globe, Ai Weiwei also reminds us that what was quickly labelled as a major crisis in Europe is nothing compared to what African and Middle Eastern countries have been coping with for years. The documentary notably highlights the numbers of refugees hosted in Turkey (2.9 million), Pakistan (1.4 million) and Lebanon (1.0 million), the three top hosting countries. 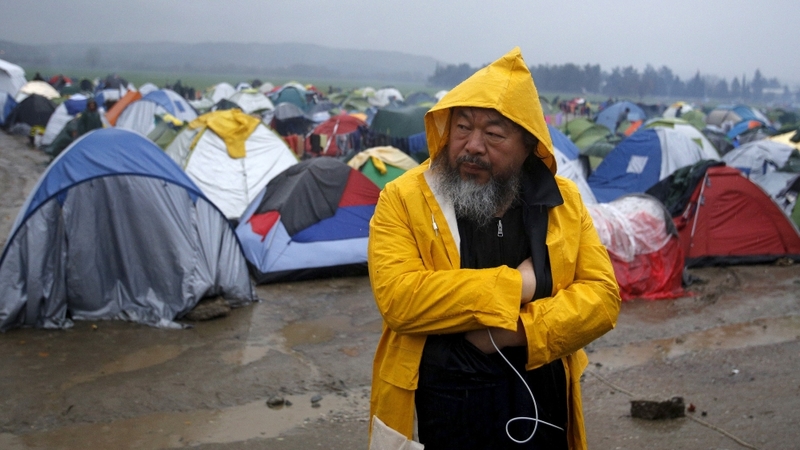 Ai Weiwei, activist and produced of the documentary Human Flow. More than just showcasing camps and the geographic scale of the issue, the documentary also reveals the huge diversity of factors, from wars to religious discrimination, that are pushing people to leave their entire lives behind. Despite managing to make the viewers feel a range of emotion including but not limited to despair, anger, compassion and sadness, the film somehow fails to highlight the actions of people around the world who are trying to help and make a difference. After 2 hours and 30 minutes of intense emotions witnessing the struggle of people from all over the world, it’s easy to just feel empty, powerless, and unsure of how to rise above all the doom and gloom. A fast growing high-yield bean variety has been recently providing South Sudanese refugees with food, allowing them to cultivate new livelihoods. We had the opportunity to ask a few questions to the founder of the Tiyya Foundation, an organisation that enables refugees, immigrants, and displaced American families to actively participate in their new community. We had a chat with the founder of The Orenda Tribe, a social enterprise in Amman, Jordan, emboldening children refugees and less fortunate communities through art. Pooja Pradeep talked to us about how an idea to send handwritten letters to Syrian refugee children led to the birth of a global change movement in Letters of Love. Despite the challenges that the refugees face and the helplessness that we may feel whilst watching these kinds of documentaries, it’s always important to recognize that there is something we can do, no matter how small.